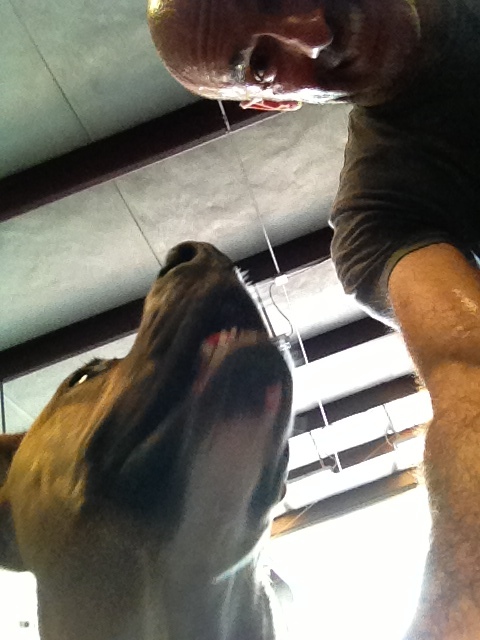 Post-WOD self portrait with Luke! While I did work out yesterday, I didn’t blog. Yup, I’ve been that busy, yo. I’m feeling much better, but certainly not yet 100%. Stupid nagging cough. I certainly don’t feel very strong. For that reason I have not yet attempted new 1RM for front squat. I hope I’ll be able to do so tomorrow or Thursday. This was a scorcher. I completed all rounds unbroken, and the round of 15 was the most challenging. I haven’t completed jumping lunges, for as long as I can remember. Rest assured, Surmounties, I’ll be programming them again. Time = 5:03. That’s pretty damn fast. There were a dozen at both the WOD and Boot Camp this morning. I know why so many attended the 6am session — they knew that Jeff was coaching! He’s a very good coach; relaxed, firm, supportive, etc. I feel completely confident in his coaching abilities. Uhm, because he knows what I expect. Ha! As Deborah was the only athlete to attend the 8am session, I worked out with her. It was very ugly, but I push pressed 145#, a little more than my body weight. I may attempt again Thursday, you know, because I’m feeling weak. This was absolutely miserable. There, I said it. Dead-lifting after running is never fun, and today was no exception. A mere 155# felt very heavy, particularly during the first round. I had every intention of completing unbroken, but after completing just 5 reps knew that I wasn’t going to be able to do so — and I dropped the bar. I completed the round of 20 in reps of 5. Wow. I did complete all rounds of V-ups unbroken, and with these abs I should certainly be able to do so. Can I get an Amen? Thank you. Deborah is one of the few people who I trust so completely. I know I can count on her to ensure that every rep counts — and to focus on form. Time = 5:03. Again. Just like yesterday. Isn’t that peculiar? I worked out once again before the 5:15 session, as I wanted to completed tomorrow’s programmed WOD. Yup, it’s quite similar to the WOD I did a few days ago. Yup, I once again completed 20 reps, although I shaved 47 seconds off of my time. Apples to oranges? Perhaps, although I’ll go on record as saying doing only ring dips was easier than completing ring dips along with pull-ups and pushups. I scaled up to strict ring dips and inverted pushups with feet on top of 24″ box. Oh, and unbroken double unders. The hardest part of the workout was remembering if I had just done pull-ups, rings dips, or pushups. Seriously. I completed all rounds of ring dips, pull-ups, pushups, and box jumps unbroken, yo. That last sentence needed a yo on the end. I missed the first first double under and thus had to re-do the first round. I completed 17 rounds of double unders unbroken, having to re-do rounds 9 (missed the 9th) and 14 (missed the 15th). Ugh. Having to re-do after having missed the very last rep was painful. I nonetheless did so. I completed the very last double under of the 20th round just before the clock beeped that time was up. Damn, I’m good at time management. ‹ PreviousThis may very well go down as one of my favorite WODs.